My very first litter ended in tragedy in 2002. I bred a red tabby to a tortoiseshell and had four kittens: a red tabby, 2 torties, and a coveted blue-cream (obviously both parents were carrying dilute). 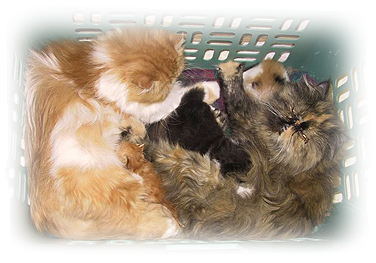 The mom-cat was inexperienced and didn’t clean up the kittens after they were born. The kittens started out chilled and then their mom wouldn’t settle down to nurse them. We immediately started bottle feeding and for the first day everything seemed fine. The next day the babies didn’t seem quite as vigorous. Then we stared to lose them one by one. I was crushed. What happened? After losing the first one I called every veterinarian in town. None offered any explanation. They really had no experience with newborn kittens and their health concerns. I was left to find the answer on my own. I began researching and reading everything I could find. I read article after article. In my search I found PandECats.com and Lee Harper. She offered sympathy and confirmed my suspicion of that I may have lost my litter to what is commonly called Fading Kitten Syndrome. Fast forward two years and four litters later to July 2004. I had two litters due in the first week of July. After successful litters in 2003, I was hopeful and optimistic. My first queen delivered two kittens and everything was great. She was a bit restless; but I figured that was due to her being a first time mother. 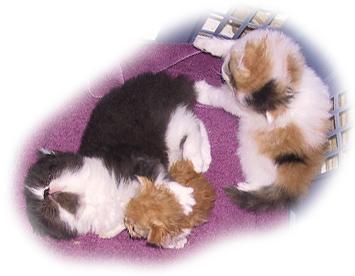 When the kittens were three days old, I noticed that they didn’t seem to be gaining weight and I was seeing the same signs I saw with my original litter – labored breathing, mucousy mouth, arched back, lethargy, weakness and refusal to nurse. It was Sunday. Everything was closed. I brought out my veterinary handbooks, logged on to PandECats.com, and started reviewing everything I could find regarding Fading Kitten Syndrome. The kittens did seem a bit cool to the touch, so I quickly heated up my microwavable heating pad and put them near it because a kitten’s digestive tract is almost reptilian in nature - it doesn’t function properly when cold. I tried offering them a bit of kitten formula by dropper to see if they were interested and the girl was; but the boy wasn’t. I was afraid I was going to lose him. Of particular interest to me at this time was an article I remembered reading on PandECats titled “Fading Kitten Syndrome”. The article outlined a basic protocol of a one-time injection of prophylactic antibiotic for newborn kittens who had a G. Strep infection that could prove fatal. I didn't have injectable Penicillin on hand, however I was a nursing mother myself and had Traditional Medicinals ‘Mother’s Milk’ tea in the cupboard - a lactation-supportive herb. I opened the tea bag and sprinkled the herbs on the mother cat's canned food. 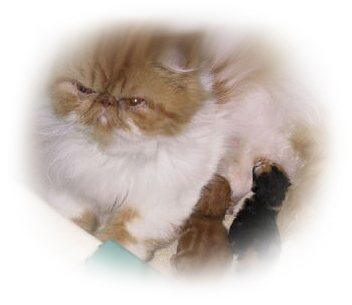 I also sprinkled a bit of FishMox into some kitten formula for the babies. The next morning, the boy looked better and the girl looked worse. I had figured that the vet would be open; but unfortunately they were still closed, so I asked the answering service to have the vet call me. When the vet did call, she started to give me the 'give them a drop of Karo syrup and keep them warm' routine. I explained about the Strep G study and the protocol for the one time injection of Penicillin. She agreed to try it and told me to meet her within the hour. She was very sympathetic and gave them Penicillin, Cortisone, and fluids. So it was an experiment to see if the "preventative" protocol would also work several days after symptoms began. Four hours later we had lost the girl; but the boy was doing much better. Since I had another queen due within the week I had asked the vet if she would be willing to give the prophylactic antibiotic for those kittens, and she agreed. The next day my second girl went into labor and she also gave birth to two kittens. I swabbed the cords with iodine-soaked cotton pads; and I took them in for their prophylactic injection within their first 4 hours. They seem to be doing very well; but this was a second time Queen who did very well with her first litter, without the antibiotic. A few days later, I again noticed that the first boy wasn't doing well again. He seemed to be acquiring what I have come to call "The Look" - meaning the symptoms mentioned above. I immediately took him back to the vet for another round of Penicillin, Cortisone, and fluids. At 10pm the little boy was still with us! He seemed to be breathing easier, was not mucousy anymore, and eagerly drank off the dropper that I was supplementing kitten formula with. I think this is evidence that this is bacterial, since it responds to Penicillin. The vet agreed and this time sent home oral amoxicillin. Several days passed and I was so happy that he was still here; but he was not really gaining weight. He was still birth-weight (96 grams) at 10 days of age. At 12 days, he weighed in at 110 grams. But at 14 days, he still registered 110 grams. I continued supplementing with a bottle, which he eagerly took! I still felt that I needed to look into the weight gain issue more since the two kittens who were five days younger were twice his weight. I also made the difficult decision to pull him off of his birth mom and put him on my other queen, whose kittens were doing much better. Sometimes, despite all you do, it just isn't meant to be. We lost the little boy. His weight gain had been slow and irregular and eventually he stopped gaining weight, and started losing as much weight as he should have been gaining each day. That was despite the increase of his daily bottles. He was nursing on his “Foster Mom”; but because he was so much smaller I felt he needed to be supplemented. We were doing 3-4 bottles a day and I increased that to 5 bottles a day, and still he lost weight. The day he died, at exactly 1 month of age, he weighed in at 129 grams - really not much above birth weight. Interestingly, his mother - who insisted I let her in to nurse him over the last days before he died - wanted nothing to do with him on that fatal morning and his foster mom wouldn't get into the basket to nurse her babies until I had taken him out. Reviewing his whole case, I think it may have been something congenital, in addition to the bacterial infection that was going on. Every moment is a teaching moment, and we learn from the painful moments - maybe sometimes more than the happy ones. I really wouldn't change anything I did. I'm glad I arranged the emergency meeting with the vet at the beginning; I'm glad we coddled him, put him on my other Queen, and supplemented. I’m glad I kept scrupulous records because I was able to know exactly what was going on each and every day. This just challenges me to work even harder to be the best breeder I can, doing everything in my power to ensure that my kittens have the best chance at being both healthy and happy. In looking back over the situation, I am thankful for the article regarding the prophylactic injection of Penicillin. I am also happy with the working relationship I was able to establish with this veterinarian. I encourage every breeder to find a vet with whom you can have a good working relationship. Although the vet will obviously know more about feline medicine in general, he or she should be willing to listen and take the suggestions of the informed client, especially since the medical issues faced by breeders tend to be something most vets would only be familiar with if they had other breeder clients. It is also unrealistic to think that a vet can, or has, read every feline study that has taken place. That is where we, as breeders, need to be pro-active. We need to educate ourselves and not only rely upon our veterinarian to be up to date on all health issues. Also, don’t be hesitant to side-step a veterinary tech who doesn’t agree with you. Even though I liked this vet, I didn’t care for the tech who told me I was over-feeding this kitten and that he simply had a tummy ache. Thankfully the vet and I had already established that this was a bacterial infection and were treating it as such. I do wish I had gotten the oral antibiotics the first time I had taken the kittens in when they were 4 days old. Maybe the little girl would still be with us. I think that it would be wise for other breeders to consider the addition of oral meds when they are dealing with infection that has already taken hold. The one-time injection may not be enough at that point in time. Unfortunately, we sometimes lose kittens as we are learning and establishing these kinds of protocols in our catteries. Education is a process. I am now a firm believer in the one-time injection after birth. It’s better, and easier, to prevent a problem than to treat one.